FILE - Dr. Albert Maguire checks the eyes of Misa Kaabali, 8, at the Children’s Hospital of Philadelphia, Oct. 4, 2017. Misa was 4 years old when he received his gene therapy treatment. "I am totally willing to use the 'C' word," said the National Institutes of Health's director, Dr. Francis Collins. The advent of gene editing — a more precise and long-lasting way to do gene therapy — may expand the number and types of diseases that can be treated. In November, California scientists tried editing a gene inside someone's body for the first time, using a tool called zinc finger nucleases for a man with a metabolic disease. It's like a cut-and-paste operation to place a new gene in a specific spot. Tests of another editing tool called CRISPR, to genetically alter human cells in the lab, may start next year. "There are a few times in our lives when science astonishes us. This is one of those times," Dr. Matthew Porteus, a Stanford University gene editing expert, told a Senate panel discussing this technology last month. It's a common path for trail-blazing science — success initially seems within reach, setbacks send researchers back to the lab, new understandings emerge over years, and studies ultimately reveal what is safe and effective. Here is a look at what's been achieved and what lies ahead. The year started with no gene therapies sold in the U.S. and only a couple elsewhere. Then the Food and Drug Administration approved the first CAR-T cell therapies, which alter a patient's own blood cells to turn them into specialized cancer killers. They're only for certain types of leukemia and lymphoma now, but more are in the works for other blood cancers. 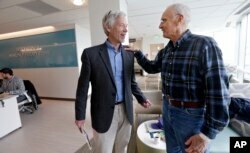 FILE - Dr. David Maloney of the Fred Hutchinson Cancer Research Center is greeted by patient Ken Shefveland, whose lymphoma was successfully treated with CAR-T cell therapy, March 29, 2017. "Oh yikes, colors. Colors are super fun," said 13-year-old Caroline Carper of Little Rock, Arkansas. "And the sunshine is blinding." Gene therapies also showed some promise against a variety of diseases including hemophilia, a blood clotting problem; "bubble boy" disease, where a flawed immune system leaves patients vulnerable to fatal infections; and sickle cell disease, a serious and painful blood disorder common among black people. "The whole promise ... is to cure diseases. It's based on the rationale of fixing the problem," not just improving treatment, said Dr. Carl June, a University of Pennsylvania scientist who pioneered CAR-T therapy. FILE - Brian Madeux sits with his girlfriend, Marcie Humphrey, while waiting to receive the first human gene editing therapy at the UCSF Benioff Children's Hospital in Oakland, Calif., Nov. 6, 2017. "I believe in science," he texted The Associated Press after doctors sent viruses containing a corrective gene and an editing tool through an IV into his body. The hope is that the gene and the editing tool would enter some of his liver cells and insert the instructions needed to start making an enzyme he lacks. It's not known yet if it worked. Sangamo Therapeutics is testing its therapy in several studies, and independent monitors will help decide when results are released. "It's a pretty exciting milestone," Collins said, because it shows a way to treat more diseases than ones that can be addressed now by altering blood cells in the lab or injecting genes into the eye. "You can imagine having a scalable approach to thousands of genetic diseases," he said. Top of Collins' list: muscular dystrophy and sickle cell. There's been so much progress that the NIH has modified an oversight panel that just a few years ago reviewed every gene therapy experiment in the U.S. Most are considered safe enough to go ahead without the Recombinant DNA Advisory Committee's review. The panel hasn't even met for a year. When the panel was formed decades ago, "there was a lot of concern that a graduate student could take some of this home and create a monster in his basement," said one panel member, Boston scientist Dr. Howard Kaufman. Those fears have eased, he said. "There's no monsters that have materialized from this."